Suitable for harsh environments, either directs buried or used outside in process control applications for example power generation, oil, gas, food and chemical works, in fact anywhere, where there is a risk of mechanical damage. It comes with an option which include collective aluminium screen to protect this cable from outside interference and individual & collective aluminium screen, to prevent crosstalk between the pairs. 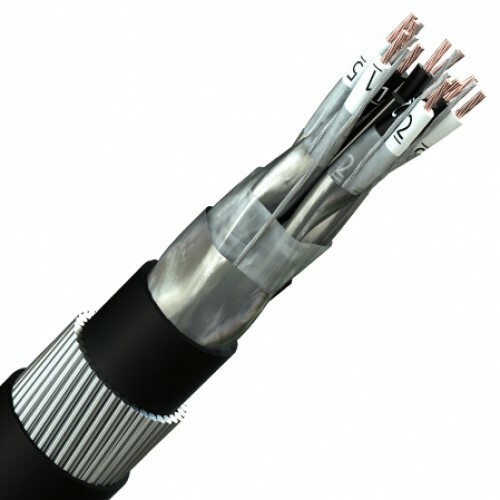 Under this standard, this cable can be found in many variations including different operating voltage & temperature, armours and fire barriers and even chemical resistant bedding. Type: RE-2Y(st)HSWAH – Collective aluminium tape screen. Plain annealed copper wire conductors to IEC 60228, class 1, 2 or 5, PE insulation, laid up as cores or twisted into pairs or triples, overall aluminium/polyester foil screen and 0.5mm2 tinned copper drain wire, LSZH bedding, GSWA armour, LSZH sheath – black or blue. Type: RE-2Y(st)HSWAH-PiMF – Individual & collective aluminium tape screen. Plain annealed copper wire conductors to IEC 60228, class 1, 2 or 5, PE insulation, cores twisted into pairs or triples, each pair aluminium/polyester foil screen and 0.5mm2 tinned copper drain wire, units laid up, collective aluminium/ polyester foil screen and 0.5mm2 tinned copper drain wire, LSZH bedding, GSWA armour, LSZH sheath – black or blue.